The benefits of boomer friendly bikes are highlighted by Business Week . Fortunately, the ranks of boomers who are determined to keep pedaling are driving a growing market for products that make bicycles more comfortable and easier to ride. Products range from better padding on handgrips and specially padded gloves to electric motors that assist aging weekend warriors to the finish line. For McAyeal, the answer to her cycling woes was a recumbent bike, which allows the rider to recline on a high-back mesh seat while pedaling. This takes the stress off the lower back, hands, neck, and crotch. Sometimes described as a lawn chair on two wheels, recumbent bikes are gaining popularity with older cyclists. 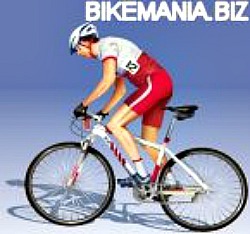 Some, such as the BikeE-CT 2.0 (www.bikee.com), costs about $700, while the top-end recumbents, such as Easy Racer's Ti Rush (www.easyracers.com) --a fancier version of McAyeal's bike--can run as much as $5,000. BIG JUMP. ''The recumbent is surging,'' says Jay Townley of Jay Townley & Associates, a cycling industry consultant in Lyndon Station, Wis. Townley says he expects bike stores to order between 50,000 and 90,000 recumbent bikes this year. ''That's a big jump for a niche that three years ago shipped 8,000 units,'' Townley says. The recumbents allow some cyclists to pedal faster and longer. On organized group rides, ''we would glide past people,'' says McAyeal, who now puts in about 2,000 miles a year. ''The only guys we couldn't pass were the 25-year-old racers.'' On long tours of 70 miles, she finishes some two hours earlier than when she rides her ''wedgie,'' as ''bent'' cyclists call conventional bicycles. ''We only gain about two miles per hour average speed, but we weren't getting off and stopping to get the blood flowing so often,'' McAyeal says. Recumbents can take a little getting used to: They require cyclists to use different muscles than than they would riding a conventional bike. Bent riders say they use the back of their legs more. And some recumbents have handlebars that are lower than the seat, so a rider would need an hour or so of practice before he or she can be street ready. Also, bents aren't optimal for city use because they are often harder to see than the taller, upright bikes and more difficult to hop curbs with. INTIMIDATING. Some boomers now taking up cycling for low-impact fitness last rode on a three-speed English touring bike with coaster brakes. For them, bicycles with 21 or more speeds can be intimidating. The industry has responded with automatic transmissions. Shimano (949 951-5003), the world's largest bike-parts manufacturer, makes a gear shifter called the Auto-D, which will come as original equipment this summer on, among others, Raleigh, GT, and Specialized bikes, all in the $500 range. The Auto-D uses a battery-operated electronic sensor to monitor speed and to shift gears automatically. Already widely used in Japan and Europe, the Auto-D controller can be set for manual push-button or faster sport shifting. I rode a bike with a prototype Auto-D two years ago and crashed while trying to get it working. But the new model that I tested a few months ago was smooth and reliable. GT (800 743-3248) also produces the Autostream (about $375), which uses a gear changer driven by counterweights that are activated by the speed of the wheels. The gear changer is simpler and cheaper than the Auto-D, but doesn't work as well: It tries to shift even when the pedals aren't turning, as when you're coasting downhill. That can make for a jerky start when you resume pedaling. Browning Bicycle Components of Baynesbridge Island, Wash., is developing a 4-speed automatic and a 12-speed automatic. VERSATILE MOUNT. Meanwhile, riders prepared for a more versatile mount won't have trouble finding one. Many companies have created ''comfort class'' bikes. For $300 to $750, these come loaded with features for older cyclists packed onto a mountain bike-type frame. Trek (www.trekbikes.com) makes the Navigator line, which is typical of comfort class bikes, offering an upright seating position that's easy on lower backs and high-rise handlebars that take weight off the wrists. Many Navigators have saddles padded with compressible gels and a shock-absorbing seat post as well. These bicycles typically ride on 26-inch mountain bike wheels and cushy, low-pressure tires, rather than the thin, hard, high-pressure tires of a road racer. Bear in mind, though, that comfort components such as stems, saddles, and shock-absorbing seat posts are easy to add on to existing bikes. Bikes with electric motors, meanwhile, are the next thing to hit the road. ''If I were going to look at a product that appeals to aging boomers, the electric is it,'' says Gary Coffrin of the Coffrin Group, a San Jose (Calif.) firm that consults with bicycle makers worldwide. Major manufacturers such as Schwinn, Giant Bicycles, and Trek now offer electric models, priced from $600 to $1,500. Lee Iacocca has jumped in the market as president of EV Global Motors (www.evglobal.com), which manufactures the $995 E-Bike. Most electrics still require you to pedal, but the motor, which typically can go as far as 15 miles before running out of juice, provides a boost, especially on acceleration. ''It may appeal to an overweight audience that thinks a regular bike is too strenuous,'' says Coffrin. There's also a market among grandparents who want to keep up with the grandkids and slower spouses who want to keep up with the stronger rider. Even younger riders may want to try them out. My girlfriend, a novice rider, took one out to see if it would allow her to keep pace with me. At about 10 miles into the ride and at the top of one particularly long hill, she began to pull away. Even if you're not pushing 50, the new bikes can help you ride with the pack and even pass it.